The very lovely Brandwatch, a social analytics company from Brighton, is sponsoring the Async developer community for the months of April and May! Brandwatch crawls the internet, archiving over 50 million instances of social media data every day. Users of the service can search via a web interface for mentions of their brand or keyword, either past mentions or to track future occurrences, using a sophisticated query creation process. The Brandwatch app includes an advanced suite of features that allows data to be chopped and sliced to provide insights, graphing, categorisation, geolocation, metadata and countless other components. Understanding and monitoring a brand is just the start: Brandwatch also lets people engage with the communities they have identified, responding to, assigning workflow and managing social media mentions with ease. 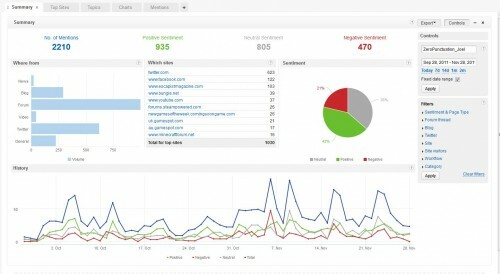 Brandwatch is the perfect platform to make sense of the chatter about a brand online. TDD / BDD experience is a massive plus, as is experience of contributing to open source projects. Some commercial experience is essential for mid/senior roles, but they are interested to hear from graduates (or soon-to-be-graduates) looking for a junior role. (These are personal accounts, so may not represent the views of the company - you know the score). If you are interested in sponsoring a month or more of Async, please read the details and get in touch with us.